MailChimp is a popular email marketing tool that enables you to design and send emails to your leads and customers. This integration will sync contacts between OnePageCRM and MailChimp and give you the ability to review recent campaigns in OnePageCRM. 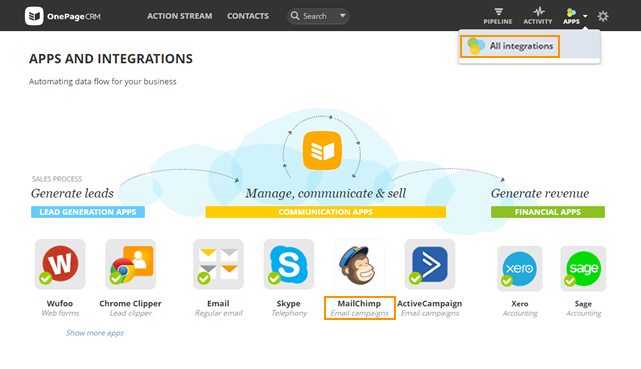 Go to Apps → All Integrations → click on the MailChimp icon under the Communications Apps category. On the Configuration tab enter your MailChimp API Key → click Connect. 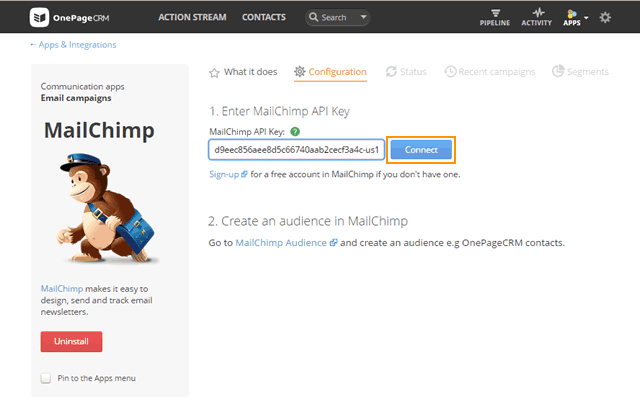 Note: To get your API key go to MailChimp → Account → Extras → API keys. 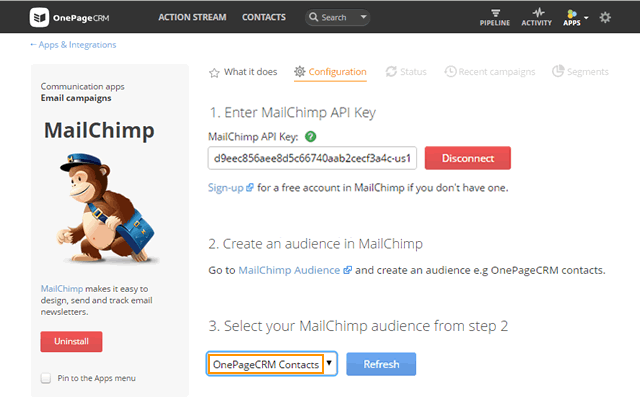 To create a list go to MailChimp → Audience → Create Audience e.g OnePageCRM contacts. Once you've created your list go back to OnePageCRM → MailChimp, under the Configuration tab → Select your MailChimp Audience e.g OnePageCRM Contacts. Next select the fields to be synced with MailChimp. Configure sync by setting your preferences. Select contacts to be pushed to MailChimp: All contacts or contacts matching a specific filter criteria. Set a suitable time to push contacts to MailChimp. Select the check box if you want to Automatically push new contacts at the sync time every day. If you delete contacts from OnePageCRM OR contacts no longer match the selected filter criteria, you have a choice to delete these contacts from MailChimp or keep them. To set this up select an option from the Contacts deleted from OnePageCRM dropdown 'will be deleted' or 'will not be deleted' in MailChimp at the daily sync. By selecting the Tag contacts rejected by MailChimp during the sync process check-box, the contacts not synced with MailChimp will be tagged e.g. "MC Incomplete data", "MC Invalid email", "MC Duplicate", "MC Cleaned, "MC Unsubscribed" or "MC System error". Learn more about MailChimp sync errors here. 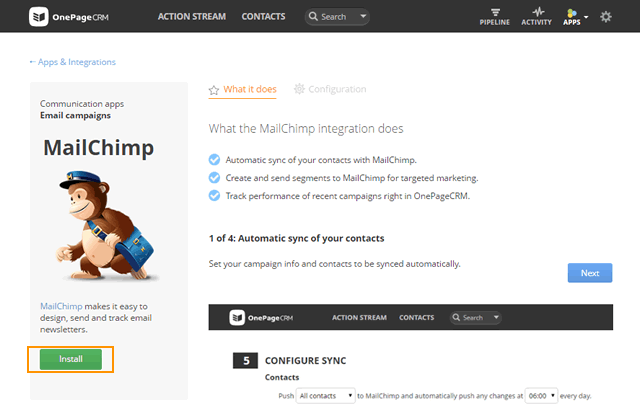 Save & Sync to finish configuring the MailChimp integration. You've now successfully synced your contacts to your MailChimp Audience. Select the Segments tab → + Add segment → Enter Segment name → select contacts from the drop down → Send to MailChimp. To create a campaign, select Create a campaign for this segment, this will bring you to MailChimp to create your email campaign. To pin the MailChimp integration to the Apps menu, select the check-box Pin to the Apps menu. Only contacts with an email address are pushed. Edited contact details will be pushed at the set sync time. All Address fields (Address, City, State, Zip, Country) must be completed in order for the Address to be pushed over to MailChimp. If only some of the Address fields are complete, then no Address information will be pushed to MailChimp. Deleted contacts from OnePageCRM or contacts no longer fitting the filter conditions are deleted from MailChimp at the sync time. 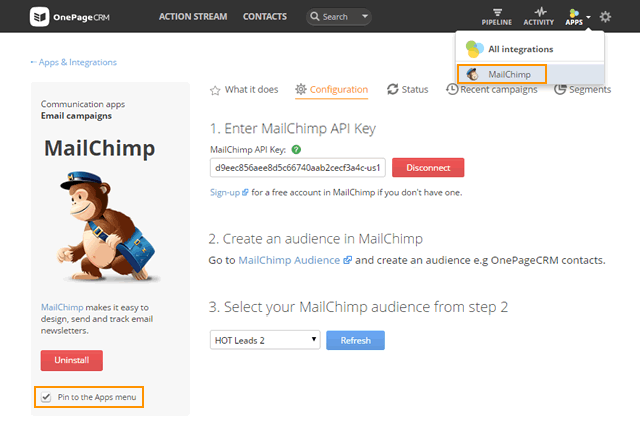 MailChimp integration can be enabled and configured by Account Owner or Administrator user. Multiple choice custom field is not supported by MailChimp. The Sync status tab will display any errors in the sync. For full details on common sync errors click here. MailChimp offers a Free Plan including 12,000 emails per month for up to 2,000 subscribers.